You Don’t Know Good Music! I can’t count how many times I have had conversations with older generations about how ‘the young people of today don’t know good music’ or if I happened to be singing along to something from the 70s for example, I have been quickly shot down with a ‘what do you know about this song, it is way before your time!’. When I was younger it used to annoy me because I didn’t understand where they were coming from. But as I have grown older, I have found myself saying the exact same things about some of the music of today. 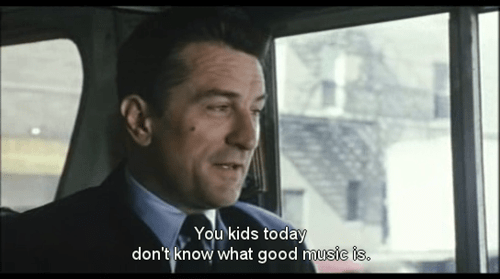 Not because I don’t think younger generations know what ‘good music’ is, but because the term itself is so diverse that it begs the question – does anyone ACTUALLY know what good music is? When I am asked what my favourite genre of music is, I usually just say that I’ll listen to anything that sounds good to me. I have a playlist called ‘En Route’ that I listen to on public transport that has songs varying from Afrobeats to Classical *flicks braids in a ladylike manner*. Trust and believe this is the truth, because even I am shocked at times at what comes up on shuffle and then after listening to it through, I am reminded why. Of course I have a couple genres that I lean more towards like 90s R&B, Garage and anything J Cole but generally, if I find myself bopping my head along to it subconsciously, I’ll most likely end up downloading it soon after. I know personally, my taste in music has been influenced by things and places that I have experienced in life. For example, I went through a phase of properly enjoying the Red Hot Chilli Peppers, Jack Johnson, Panic! At The Disco and many others during my time at school because I used to hear them being blasted nearly every day. N.B. I went to boarding school in the great British countryside for a LOOONG time, so when I say I used to it hear it every day, I truly do mean EVERY. DAMN. DAY! As a result, if I hear some of those songs today, I will find myself singing along – BUT, does that necessarily make it good music? Music also has a tendency to grow on people, I know some songs definitely have in my experience. There are a lot of albums and songs that when I first heard, I couldn’t listen to all the way through because I thought it sounded terrible. Then later, if that artist or song comes into conversation I have found myself going ‘I never used to like that song but it grew on me’. In that instance, can those kind of songs be called good music? In fact, what does ‘growing’ on you even mean? I think this phrase alone shows just how powerful a tool music is because this growth is kind of a way of rewiring the way the brain thinks about that song each time you hear it until you eventually enjoy listening to it (I know I’m getting a bit too deep but it makes sense!). Now I can’t write this and try to lie and say that there isn’t such a thing as bad music. Because the good Lord knows that there most definitely is. Again, it is a matter of preference, opinion etc but OHMYGOODNESS, there is some terrible music out in the world that shouldn’t even be classified as music. I am a self-confessed lover of all things music, but there are somethings even I can’t be swayed to listen to. For example, I enjoy House music – to an extent. There is only so much of the same repetitive electronic beat I can listen to before I get headache. Also that rock music where they scream and sound like they’re in pain – just thinking about it makes my heart hurt. So to round up, I know many people will be thinking that ‘good music’ is all a matter of opinion, perspective etc, but surely there must be some genuinely GOOD music. Music that universally is enjoyed by the masses and that in a varied and diverse group of people, all could say that they enjoyed that album/song? I don’t know if that is a thing but what I do know is that I, as an older generation will take great joy in telling my kids that they don’t know good music – purely for the bants. Bezzy’s Thoughts – Black Lives Matter in the UK?